Understanding the requirements, needs, and implementation methods for an ISO 9001, TS 16949, TL 9000, AS9100, and ISO 13485 based quality management system (QMS) can be a difficult task. Organizations spend a great deal of time and money in simply trying to understand what they need to do. This time and money is better-spent improving the business and providing products or services to the customer. In order to eliminate the time and expense of discovery, mistakes, and trial and error Pinnacle Enterprise Group (Pinnacle) has created the Lean QMS® Curriculum. The Lean QMS® Curriculum is a comprehensive approach that provides your organization with the knowledge and skills needed to effectively develop, implement, and maintain of a lean and high performance Business Management System. "...my biggest concern, like in most companies, was how do you get through the bureaucratic documentation structure. Knowing the difficulty in managing this, I was immediately sold on Pinnacle's Lean QMS methodology and simplification in providing RAD with an effective and efficient solution in documenting the quality system. We achieved registration in seven months. This included dual registration to TL 9000 & ISO 9001. Thanks Pinnacle for an excellent job!" Pinnacle's approach is more than a simple QMS standard certification program. Simply addressing generic requirements and passing a Certification Audit just buys you an expensive certificate to hang on a wall. To bring long-term value the QMS must be rational, practical, and efficient. It must continually define, describe, and control all business processes (including quality, technical, and regulatory processes). Furthermore, maintaining registration (certification) mandates a sustained mind set and proficiency. Simply put, your staff must have the skills and knowledge needed to take ownership of the process and have the ability to maintain and improve it into the future. As part of the Lean QMS® Curriculum, a Pinnacle Project Director is assigned to your organization to serve as your teacher, coach, and mentor through each element of the project. He or she transfers the knowledge and skills to your staff by working hands-on with them at your facility(ies). Each element of the Lean QMS® Curriculum and each visit by the Project Director are customized to ensure that your organization can effectively develop, implement, manage, use, and improve your Quality Management System while maintaining certification. One of the objectives is to eliminate the dependence on additional outside assistance. Furthermore, each custom tailored Lean QMS® Curriculum is delivered at a fixed cost and is typically completed within 3-6 months. While this paradigm may be appropriate for describing a documentation structure, companies rarely operate in this way. In fact, this paradigm is typically the cause of over documentation. The resulting paperwork glut quickly becomes "shelf-ware" and a burden to the QMS. Support Processes (SP) - Processes that facilitate, monitor, control, and improve the QMS, but do not directly impact the product/service or the customer. 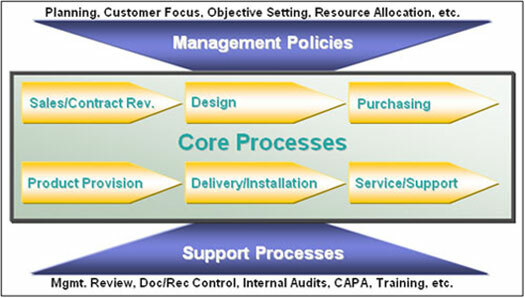 Core Processes (CP) - A set of sequenced and interrelated processes defining and controlling all product and service realization activities. These are processes directly impact the product/service and/or the customer. 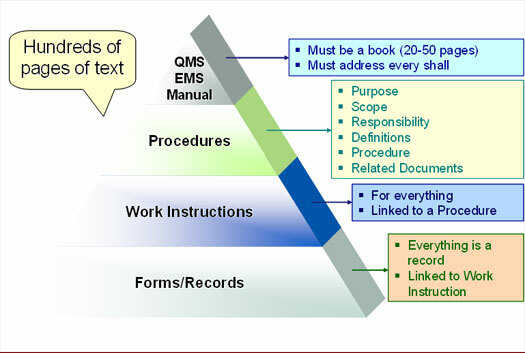 Work Instructions (WI) - Specific or individual task level instructions that support the fulfillment of Core or Support Processes. This process model is the foundation for Pinnacle's Lean QMS® methodology. The resulting QMS documentation exceeds the requirements of ISO 9001, TS 16949, TL 9000, AS9100, and ISO 13485 while laying the foundation for a rational, practical, and Lean BOS®. ISO 9001, TS 16949, TL 9000, AS9100, and ISO 13485 require an organization to describe "the interaction between processes" of the QMS at the highest level. This is the role of the traditional Quality Manual. The intent is to articulate and demonstrate that you view your business as a set of interrelated processes (vertical and lateral process integration). describes the rational interaction between your QMS processes. This unique approach eliminates the non-value-added traditional Quality Manual and the time organizations spend creating, editing, and maintaining it.